Meet the AtmosFEAR® Tour HZ, a professional, tour-ready, 1,000-watt haze machine that is capable of producing up to 8,000 cubic ft. per minute of continuous haze output. It is the perfect solution for applications of any size and scale. These are very well built units. The machine is housed in an all-black ATA-spec flight case with detachable front cover with carry handle, and features dual recessed butterfly latches for quick access to the front panel, which is the business end where all the magic happens! Setting up an AtmosFEAR® Tour HZ for use couldn't be easier. Just fill up its 1.9L fluid tank with any quality water-based haze fluid and give it some power. Then after a quick 6-minute warm up time, it's ready for big time action. 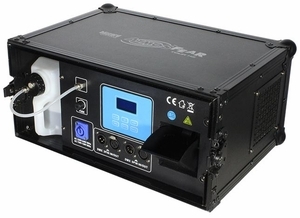 Using its 6-button LCD control panel, you can easily setup timed haze emissions with both interval and duration settings anywhere from 0-200 seconds, or just press the manual haze button for instant output. You also have total control of the fan speed and volume output settings, optional automatic low fluid shutdown, and users can manually adjust its 6-position, movable haze guide for precise directional output control. AtmosFEAR® Tour HZ units feature an industry standard powerCON®-compatible input connector and 3/5-pin DMX in/out data connections.